There seems to be an industrial-strength hallway runner here... protecting the carpet? From... from... from what, exactly? And for what optimistic reason? I think the carpet is the least of their worries. Actually I think it's a slip & slide and probably is hooked up to the stovepipe in that other residence. 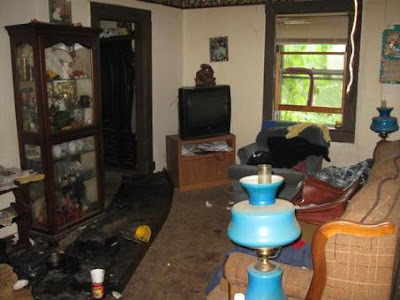 I'm always shocked by how other people live based on the pictures from your site...whether it be scary clown paintings or dirty floor mats, I'm always curious about the previous inhabitant's lives. This house isn't even abandoned...all the furniture is still there! What is the excuse for this mess? and is described as "unkemp". Assuming they mean unkempt, I believe they have mastered the art of understatement. Yeah...but what's that white cord hanging down from the ceiling?! Best of all, in spite of its industrial fortitude, it appears to be shying away from those terrifying blue lamps. Well, the runner does kind of seem to draw the eye away from the rest of the room. That's optimistic, right? Nevermind, I like d~'s answer better. Oh look! They were rehearsing the Oscars but with a black carpet instead of red.